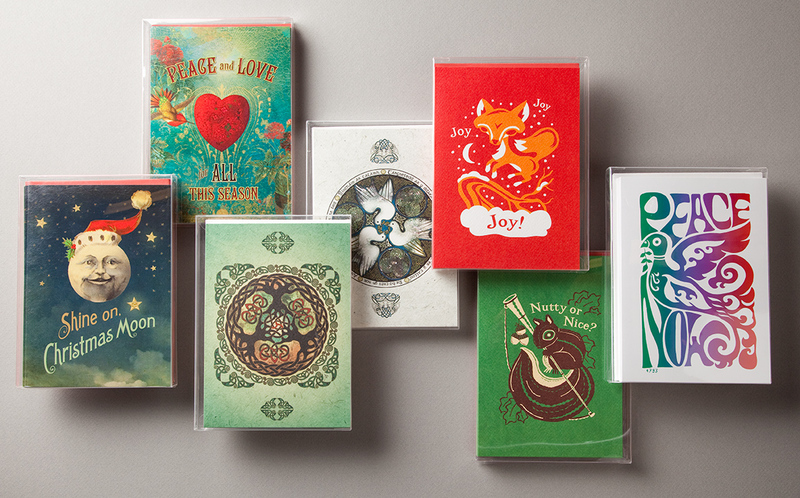 Introducing our latest holiday cards, featuring Duirwaigh Hearts and Moons, Furturtle Show Prints, Celtic Mandala art with seasonal blessings, classic Peace Posters and the whimsical Tree-Hugging Santa. Our cards are printed on recycled cardstock with soy-based inks. Cards are 5″ x 7″ and sold in clear boxes of twelve cards with envelopes for $13.99. Duirwaigh Studios is home to the creative talents of the husband-and-wife team Angi Sullins and Silas Toball. They specialize in the three Es: enchantment, enlightenment and entertainment. The Duiwaigh Studios inspiration comes from old-world fairy tales and myths and the natural curiosity for anything that explores the space between heaven and earth. Travis Bone of Furturtle Show Prints pairs witty words with whimsical illustrations. Furturtle Show Prints is known worldwide for hand-printed Gig posters. The Furturtle card lines are printed on recycled textured watercolor paper, which gives it a wonderful artisan feel. Celtic Mandala art with seasonal blessings by Jen Delyth, a Welsh artist whose work is founded in her deep connection to her Celtic heritage. She creates intricate paintings and illustrations using traditional egg tempera and contemporary digital techniques. Her original, iconographic style is inspired by the Spirit in Nature and expresses our mythic connection to the natural world. The Celtic Mandala card lines are also printed on recycled textured watercolor paper. Godzilla & King Kong by Steff Geissbuhler. Geissbuhler is among America’s most celebrated designers of brand and corporate identity programs. His work also includes posters, brochures, books and illustrations. Peace Now, Artist unknown. Poster Image courtesy UC Berkeley 1970 Workshop / Lincoln Cushing collection. Tree Hugger: a person with strong environmental beliefs who embraces eco-conscious living and all that is good for the earth and its inhabitants. There are a lot of good reasons to love trees, whether for their majesty and diversity as living creatures or because of their crucial role in the global ecosystem. Trees for the Future (TFTF) has helped rehabilitate environments across the globe by planting nearly 65 million trees since 1988. Amber Lotus Publishing is proud to be a partner in this wonderful program. All these cards are available to purchase on our website and at select retailers. This entry was posted in Artist Spotlight, Celtic, Environmental Art, Holiday Lore, Inspiration & Spirituality, Poetry, Posters, Rock and Roll Posters, Spirit, Trees and tagged Holiday Cards on October 8, 2013 by Amber Lotus Publishing.